AURORA, Colo. – The unbelievable pain of a missing child was too much for an emotionally distraught Aurora mother as she pleaded for help from the community. “Please bring my baby home,” said a tearful and shaken Stephanie Puckett during a Sunday morning press conference. "Please help me find him." Puckett’s 6-year-old son, David, went missing around 5:30 p.m. Saturday in the 15700 block of East Amherst Place , near Olympic Park in Aurora. Police say he voluntarily left and don’t believe any foul play is involved. David may be wearing camouflage pants with black and orange boots, a black shirt and tan coat. He is about four feet tall, weighing 48 pounds with light brown hair and blue-green eyes. He has a minor learning disability. Police said David has a history of wandering. Police mentioned two other occasions where David was found by neighbors. The family was home at the time David wandered off Saturday. David is a student at Dartmouth Elementary and may have possibly gone to a classmate’s home. 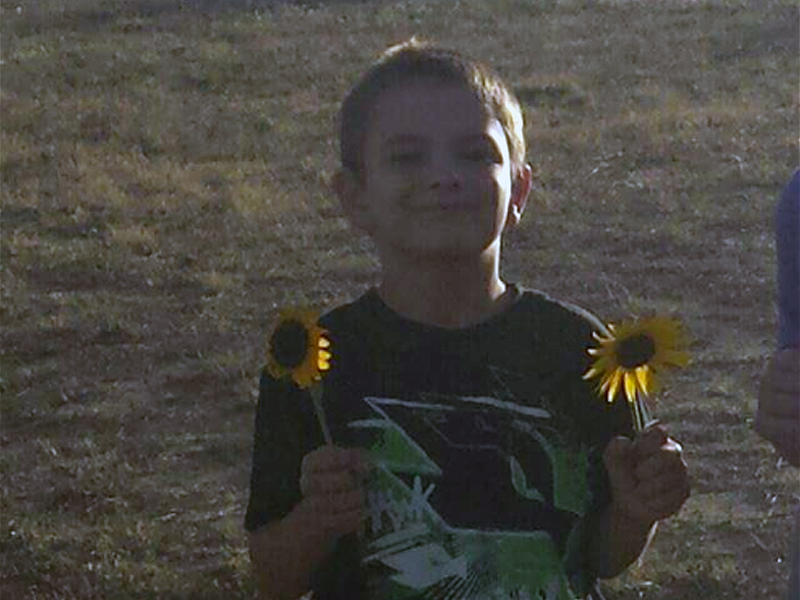 Police said other parents might not be aware that David has been reported missing. They are asking neighbors to check their homes and property for David. Police used an automated phone system to contact at least 27,000 residents about the search. Police are calling the search for David their main priority. They are combing the neighborhood on the ground and in the air. 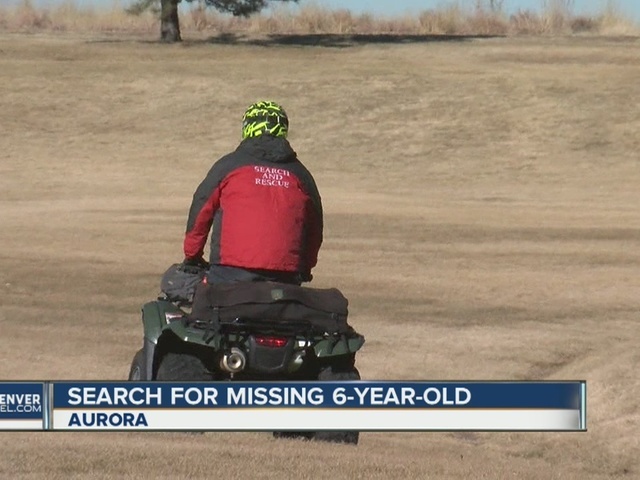 The Arapahoe County Search and Rescue Teams were out on ATVs helping to look for David. The Denver Police helicopter aided in the search Saturday night and drones may be used Sunday. Joining the large force of police and Arapahoe County deputies were more than 150 volunteers that came out Sunday to help with the search. Authorities had asked volunteers wishing to join the search to meet at the south side of Olympic Park located at 15501 East Yale Avenue. Volunteers will be required to check in and provide a name, address, drivers license and sign a waiver. Police say David’s disappearance does not meet the criteria for an Amber Alert. The Colorado Bureau of Investigation sets the standard and makes the decision on whether or not to issue the alert. 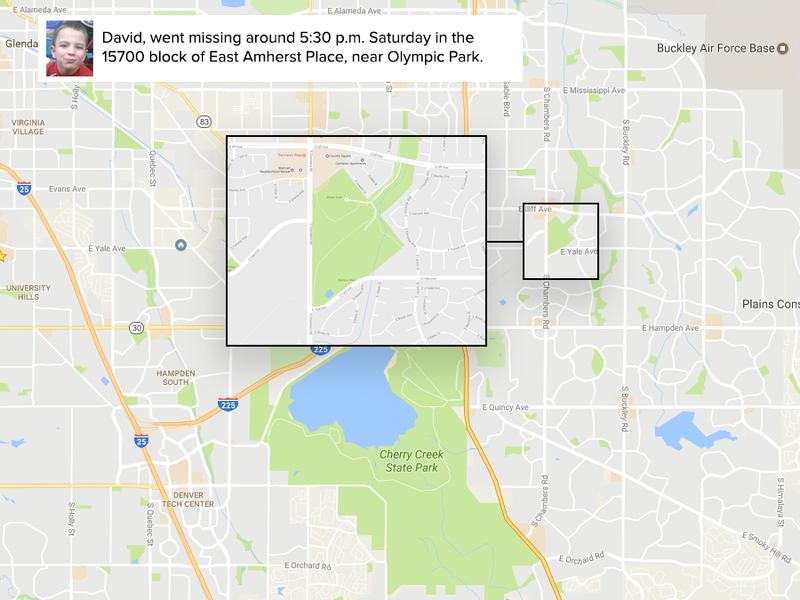 Although this case may appear to fit all three of the categories, police believe David's disappearance was not associated with any foul play. Police say call 911 if you see David.